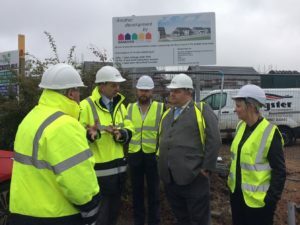 A new Hanover Scotland social housing development at Stonecross Hill in Elgin has been welcomed by the leader of Moray Council as he visited the construction site. Councillor Graham Leadbitter visited Hanover Scotland Housing Association’s new 16 home site at Stonecross Hill which is being delivered on a design & build basis in partnership with Springfield Properties and Moray Council and part funded by the Scottish Government. Joining him on his visit was Councillor Louise Laing, chair of Moray Council’s communities committee. The new development of affordable housing, which will be known as Stonecross once completed, is expected to open in March 2019. It will consist of 16 general needs homes, ranging from one-bedroom cottage style flats to three and four-bedroom semi-detached houses. Hanover Scotland has a common housing register in Moray and is working closely with Moray Council on the future allocation of Stonecross houses. Hanover has 26 developments in Moray, including Varis Court which was opened by the First Minister in July 2017 and Linkwood View which was officially opened by Christina McKelvie MSP, minister for older people and equalities, just last month. Stonecross is one of two developments that Hanover Scotland is currently delivering in the Elgin area, the other being at Hamilton Gardens at Spynie. 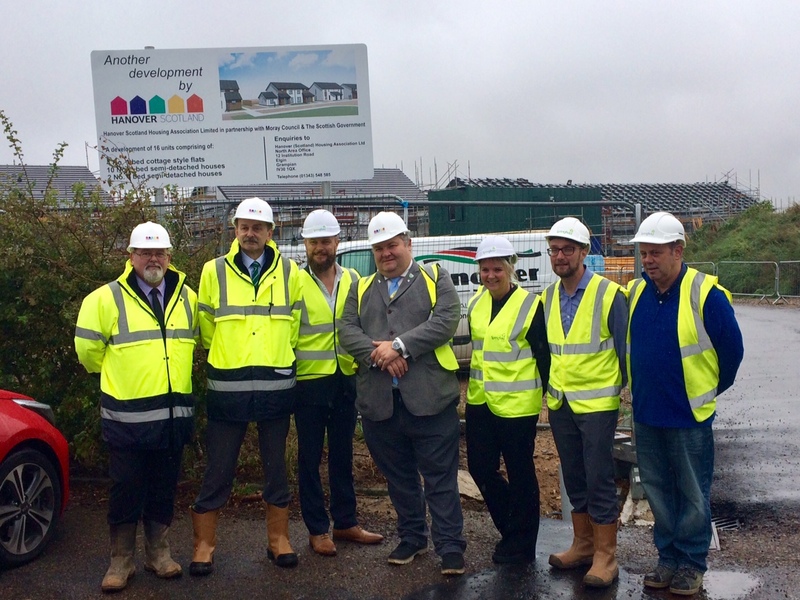 During their visit, Councillor Leadbitter and Councillor Laing met with senior managers from both Hanover Scotland and Springfield Properties and were given a tour of the site, learning more about the design and the work being carried out by the construction team. Mark Farey, director of asset management at Hanover Scotland, said: “Moray is a major focus for Hanover Scotland and we are proud to be working in close partnership with Springfield Properties and Moray Council to deliver high-quality social housing at Stonecross Hill. 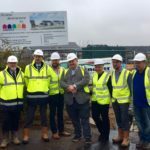 Councillor Graham Leadbitter said: “When the housing application was originally approved for this area there were concerns in the local community, however regardless of the issues about the location I believe people understand the need for supported housing like this. With an ageing population having a broad range of housing options available is absolutely vital. Springfield Properties group partnerships managing director, Tom Leggeat, said: “The 16 homes at Stronecross are highly energy efficient and use air source heat pumps which will keep running costs low for customers.